Photo: This photo by George Leukel III shows a surprise 1992 nor'easter that caused millions of dollars in damages in Ocean City, Maryland. 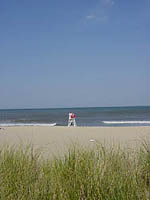 Delaware and Maryland beaches are blessed with mild weather throughout the year. Our average temperatures are 63 in spring, 84 in summer, 62 in fall and 41 in winter. For more specific weather information, here are some useful links. Huge, up-to-date doppler radar image for this area. Really Nice, provided by AccuWeather. Great up-to-date satellite image with links to U.S. Forecast Maps, Jetstream Maps, Temperature Maps, Precipitation Maps, Travel Weather Maps, High Winds Maps, and more provided by AccuWeather. A quick look at things you should know about hurricanes, such as how to prepare and what to do after you've returned home if you have been evacuated. In Depth Information about Past, Present and Forecasted Hurricanes, with weather maps, tracking maps and history of storms. Very easy to use. 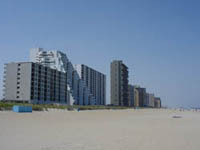 Outstanding site by FEMA that provides tons of information on preparing for and recovering from natural disasters. Home page of relief organization with advice on helping out in times of disasters such as hurricanes. Very nice weather site, plenty of maps, forecasts and radars. A nice Weather web site list. A big site with lots of different weather maps.